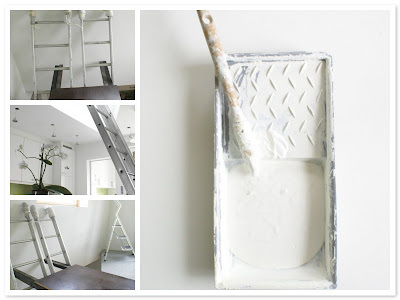 We have been very busy painting the laundryroom, toilet, kitchen & atelier. The last room is not so evident to paint as it is a 'vide'. I'm not sure if I'm using the right word here, but it is a room above our kitchen which can be reached from the kitchen by using a ladder. So there is lots of open space but how do you paint those walls? We made a construction of ladders and wood so that we could actually reach the ceiling & walls. It is not very big but very uncomfortable to paint. However, I love this spacious feeling. When I'm in my atelier, I'm also in my kitchen and that was what I wanted when this room was designed. I love sitting in the kitchen - also when there is no food around! :) Our little garden when I look outside my atelier window - still needs more green I think!